Will BETTER CALL SAUL Be A Dud? People are reporting that Vince Gilligan is saying he has reservations about his new series, Better Call Saul. Yikes, but yes, that question is in the air. For any Breaking Bad fan out there, there's been little snippets of news lately. But now, in an interview with THR, series creator vince Gilligan seems to be questioning if the spin off from Breaking Bad, Better Call Saul, is going to be any good or not! Q: Spinoffs can be tricky, particularly with something so beloved and, in the case of Breaking Bad, so recent. Vince, what has that process been like for you so far? GILLIGAN It's scary. It opens you up to a lot of fears. Is this going to be Frasier -- or After MASH? If it's After MASH rather than Frasier, it won't be for a lack of hard work, wishful thinking and a lot of smart people doing their best. But it's a high-class problem. WEINER Did you take any time off after Breaking Bad? GILLIGAN A couple months, but I was doing a lot of press and talking about Breaking Bad right up until we started the new show. But it's not a bad thing. What's that old expression? You can rest when you're dead? That gets closer by the minute! Many outlets are reporting that he further says that this might have been a mistake to do this, but it's not in the transcription of the conversation. Either way, as you see, Gilligan is realistic about the process and is prepared for the possibility that fans won't ingest the show. 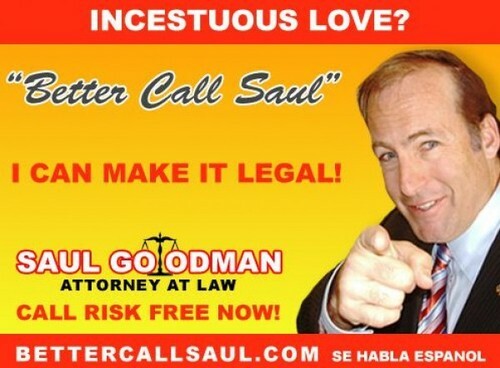 But it's Saul. He was the light of the show sometimes and I'm not sure how it could go afoul, but hey, we'll see. Better Call Saul is the spinoff from Breaking Bad, focusing on the shady and resourceful lawyer, Saul Goodman, who was and will be played by Bob Odenkirk. Also in the cast is Jonathan Banks who plays ‘Mike’ the “clean up guy” and we've been tempted with the notion that Aaron Paul and Bryan Cranston may reprise their roles in cameos. Filming for the show started up last Monday and is due out on AMC in Novemeber!